The Sign of Four, also made originally to be screened on HBO in 1983 like The Hound of the Baskervilles, isn’t quite as successful as the other Sir Arthur Conan Doyle adaptation. It’s possibly more of a problem with translating the source material to screen than with any particular problem of production. The story of The Sign of Four isn’t quite as exciting as a luminous monster dog, especially when it becomes clear that the four are just looking for some treasure. 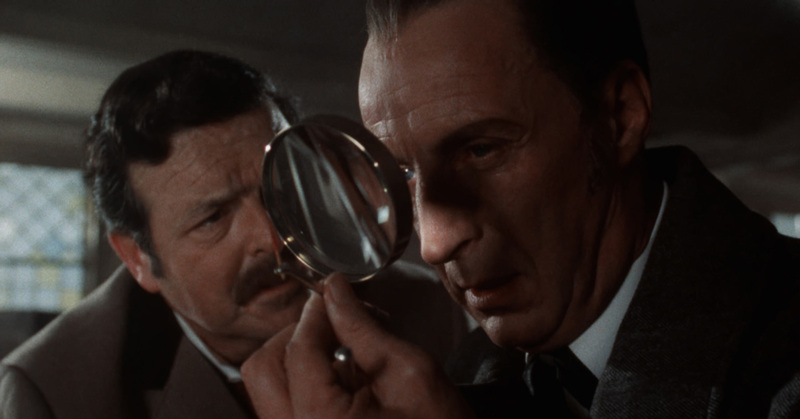 The staging is fine – taking place in an earlier period than Hound Richardson’s Holmes is slightly more authoritarian than in the other film – still playful, still liking to dress up, but definitely more in charge of things. This is Holmes as a younger man, a physical man unafraid to get into a scrap, and clearly relishing dressing up and running the Bow Street irregulars, his homeless network of young scamps. He has a proper dust up, shoots guns, races boats. Very much more a figure of daring do, even if he doesn’t strip to the waist like Robert Downey Jr. Although the action sequences are well realised (a race on the foggy Thames is beautifully realised and properly evocative of the era being depicted) they aren’t as narratively compelling as in Hound. Indeed a lot of the investigation is done by other people, with Holmes acting on information provided to him by others. This time around Watson is played by David Healy, providing a more Billy Bunter-esque buffoon of a character than Donald Churchill’s exasperated but not unintelligent Doctor. The supporting players are all fine too including Clive Merrison who has played Holmes himself several times on Radio 4. Cheri Lunghi is the young ingenue who hires the sleuthing duo, after the mystery of her father’s disappearance and a map which should reveal the location of a hidden fortune. Joe Melia appears as a threatening figure from the past, and is accompanied by a pygmy character called Tonga. Unfortunately Tonga is played by the actor John Pedrick wearing black-face make-up, which makes for uncomfortable viewing. It’s a slightly ridiculous and embarrassing baddie character – which is Conan Doyle’s doing and does the film no favours. The Sign of Four is an entertaining watch, just not quite up there with the other offering from 1983, The Hound of the Baskervilles – we’d recommend you check that one out first. It’s still good fun though. The Sign of Four is also out on Monday 25th April on Blu-Ray, DVD and digital download/ on demand.